Every summer for the past 15 years or so, we have been lucky enough to return to Spetses. And every year we have been able to take a least one late afternoon boat trip out with friends to enjoy a beach a short ride away. Sometimes the trip has been around the island, stopping at 3-4 different places to swim along the way. Other times we gone to beaches on the mainland or just around to the other side of the island. Mostly its the weather that dictates where we go. But, weather permitting, the first choice with most is to go to Kounoupi, a little island about 20-30 minutes away by boat. Kounoupi means mosquitoin Greek, but the island’s name doesn’t refer to the amount of bugs, just its small size, which is tiny really, small enough to swim around if you are so inclined. But most friends aren’t. We just laze around on the small beach, taking frequent dips in the water and sharing food from the dozens of bags that get unloaded like a 747 on to the beach. Usually it around 5pm when we arrive and the sun is still warm but not scalding and its a much more comfortable time to be at the beach. Ten years ago, most of the kids were little, bobbing around in the shallow water with water wings while we watched from the shore. When they got older, jumping off the Kaiki roof became the main activity. Hours of entertainment! I never was brave enough to do it too, nor did my stomach ever quite stop doing a flip every time a child jumped. We still couldn’t take our eyes off them for fear of a bad fall or somebody landing on another’s head, but no accidents thank goodness. These days the kids are almost all seniors or college age and the years are numbered that everyone can converge altogether. They mostly lounge around on the beach like the adults or take 10 zillion photos of one another. Kaiki roof jumping is still cool, just not as all-consuming as before. 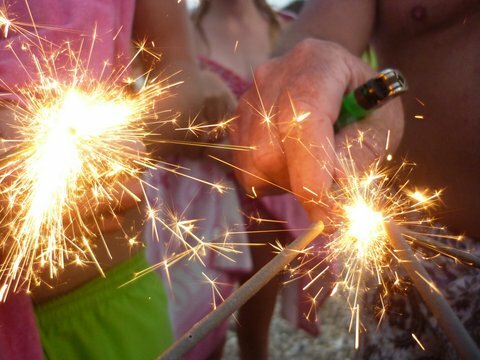 This year we celebrated Latham’s birthday on the beach with 10 year old sparklers that I pulled out of the back of the cupboard somewhere. Amazingly they still lit. We ate a crumble birthday cake — this year it was peach or rhubarb — and sang happy birthday just as the almost full moon was making an appearance behind. The best part though, for me, is the last part of the day. The sun starts to go down and the water and sky turn a nowhere-else-on-earth purple for a magical 20 minutes. As it starts to get dark and the chain of bag loaders have done their job, you realise that there is no choice but to get back in the water and swim to the boat. The water seems cold and the idea of getting wet and staying wet for the journey back seem so uninviting. But in you go — because you must — and the sea is warmer than you thought, the moon is shining on the water and suddenly swimming all night seems like a really good idea. For the trip back, the kids traditionally all climb to the roof where they all get the best view (why is that? and when do we get a turn?) and we take a moonlit ride home. Lovely photos that reminded me of the kaiki trips we have taken too. You all look like you had an amazing time as always! Lots of vodka no doubt! Next year I propose the ladies should take the roof!